We have just returned from our 1st cruise.we were a little weary of such a large ship but loved it...took us a day or two to work out which lift took us nearest our cabin. Ship is so clean and staff do a great job keeping it so.Cabin had loads of hanging space and bed was very comfortable . We had the drinks package included in our package..i would advise this as drink is very expensive. Food was excellent although we found taste restaurant very cold so only ate there once..Manhattan restaurant can get very busy so go early.We ate in cagneys speciality restaurant ,steak&apos;s were great, buffet was amazing and we also enjoyed the spelgel cirque de dreams, entertainment was excellent here as was the choice of the other entertainment around the ship. Found embarking and disembarking a breeze. Rome..... We booked SAS round trip taxi and managed to see Vatican Museums (make sure to book your tickets on line before going)it doesn&apos;t be as crowded on Wednesday mornings as the pope has his audience then. ,ST Peters bascilica, panethon,trevi fountain, Altare Della Patria and coliseum. Couldn&apos;t believe we got to see all this in one day. Naples and almalfi coast with Sorrento and Pompelli were Amazing. Cannes. .. beautiful. walked around at our own pace most enjoyable. 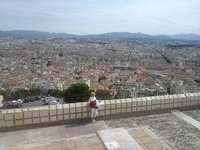 Marseille...Took the little train around town getting off at Notre Dame Grande... spectacular with stunning views.. Will hopefully do Eastern Med next time. Must mention crew and staff were all very happy and always had time for a quick chat. We have just returned from our 1st cruise.we were a little weary of such a large ship but loved it...took us a day or two to work out which lift took us nearest our cabin. Ship is so clean and staff do a great job keeping it so.Cabin had loads of hanging space and bed was very comfortable . We had the drinks package included in our package..i would advise this as drink is very expensive. Food was excellent although we found taste restaurant very cold so only ate there once..Manhattan restaurant can get very busy so go early.We ate in cagneys speciality restaurant ,steak&apos;s were great, buffet was amazing and we also enjoyed the spelgel cirque de dreams, entertainment was excellent here as was the choice of the other entertainment around the ship. Found embarking and disembarking a breeze. Rome..... We booked SAS round trip taxi and managed to see Vatican Museums (make sure to book your tickets on line before going)it doesn&apos;t be as crowded on Wednesday mornings as the pope has his audience then. ,ST Peters bascilica, panethon,trevi fountain, Altare Della Patria and coliseum. Couldn&apos;t believe we got to see all this in one day. Naples and almalfi coast with Sorrento and Pompelli were Amazing. Cannes. .. beautiful. walked around at our own pace most enjoyable. Marseille...Took the little train around town getting off at Notre Dame Grande... spectacular with stunning views..
Will hopefully do Eastern Med next time. Must mention crew and staff were all very happy and always had time for a quick chat. We found cabin to have loads of cupboard space.. Great shower .comfy bed. Large balcony.We found we didn&apos;t spend much time in the cabin as there was too much too do. took little train around city and up to the Notre Dame Grande. Stunning views and great service from an informative guide. loved positano, stunning views had a lovely lunch in a local restaurant. Would recommend this company, clean cars informative guide.